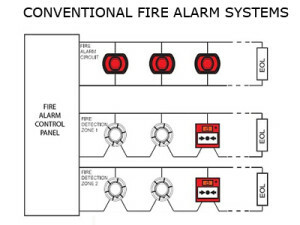 A Conventional Fire Alarm System normally consists of a control panel linked to a number of lines of fire detectors and manual call points, normally called detection zones, and a number of sounder or alarm circuits. The Control Panel drives the detection zones and sounder circuits, provides LED indications of fire, fault or normal conditions and contains switches to allow the sounders to be activated or silenced and the detectors to reset following and alarm. The control panel is powered from the mains (230VAC) and will contain back-up batteries to allow the system to function for a minimum of 24 hours, dependent on the application, in case of main failure. Most conventional fire alarm panels have several detection zones comprising a mixture of automatic fire detectors and manual call points. In order to limit the effect of faults, and to limit the search area in the case for fire, the size of fire detection zone is limited to 2000 m², with a maximum travel distance within the zone to locate a fire of 60m. In addition, zones should not cover more than one storey, unless the total floor area of the building is less than 300m². As a result unless the site is very small, the system will comprise several detection zones. A fire alarm (or sounder) circuit may cover more than one detection zone, but it must follow the boundaries of the relevant detection zones, and the boundaries should be of fire resisting construction.